Product #16928 | SKU PC-333B | 0.0 (no ratings yet) Thanks for your rating! 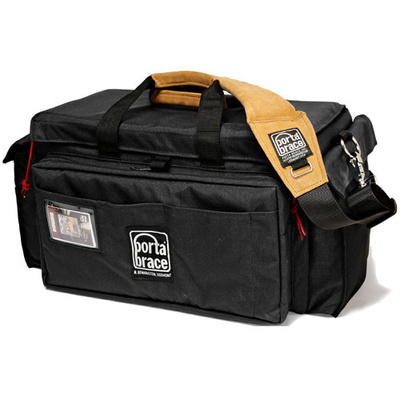 The Porta Brace PC-333 Medium Production Case (Black) is designed to organize a load of accessories in one efficient, easy-to-carry protective case. The production case is crush-resistant thanks to a combination of a full-width, rigid panel set between layers of Cordura nylon, and a bonded foam and plastic, lightweight rigid lid. There are interior partitions that can be positioned to accommodate numerous combinations of cassettes, batteries, mics, cables, filters, wireless mics and mixers. The PC-333 has one large outside front pocket, two padded side pockets, four interior mesh pockets and a well positioned mic holster adds to the versatility of this case. There is a divider kit included to customize the inside of the case. It is carried by a removable, adjustable, medium-duty suede leather shoulder strap and suede leather carry straps. 1000 denier Cordura bag made to carry video and audio accessories. Equipment is protected by a lightweight rigid lid with a bonded foam-and-plastic interior, and a full-width, rigid, hollow-core plastic panel.